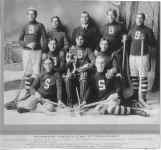 Back Row L-R: Robert Foley -mascot, George Munn -mgr, E. Johnson -LW, H. Kitto -RW, L. Cappello -trainer. Seated L-R: B. Rogers -center, W.J. Ruhl -Capt & Pt, F. Schieve -goal, H.L. Grahel -CPt, Wesley Munn -rover. 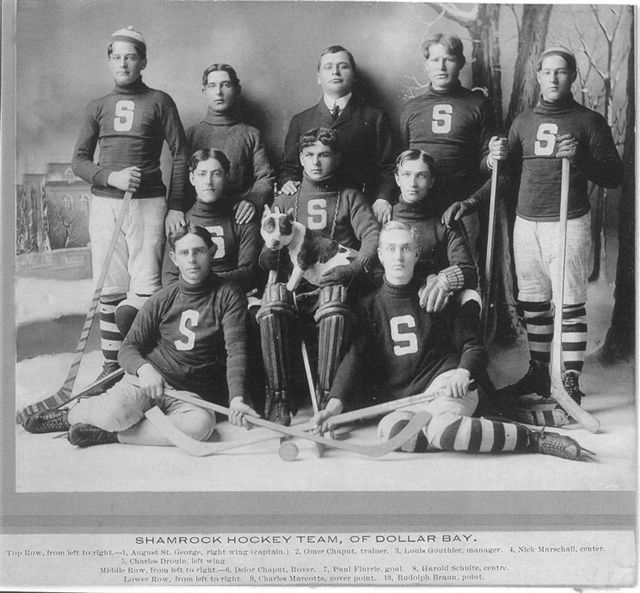 Photo courtesy of the family of H. Kitto. 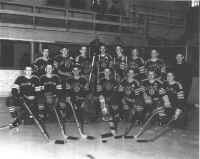 Top Row L to Rt: August St. George -Capt-R Wing, Omer Chaput -Trainer, Louis Gouthier -Mgr, Nick Marschall -Center, Charles Drouin, L Wing. 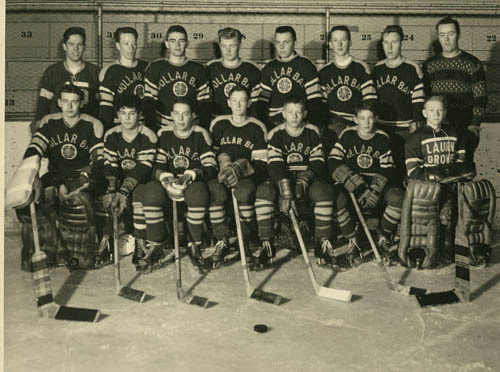 Middle Row: Delor Chaput -Rover, Paul Flurrie -Goal, Harold Schulte -Center. Lower Row: Charles Marcotte -Cover Pt., Rudolph Braun -Pt. Please contact webmaster if you have any pictures or info about other Dollar Bay teams. 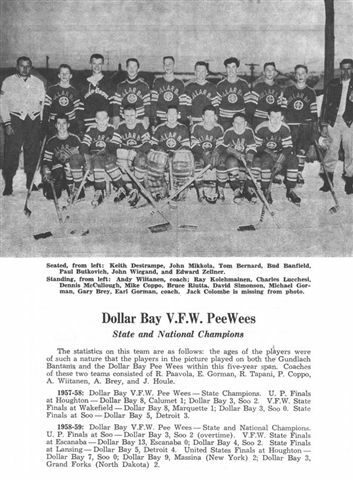 Standing L-R: Coach Andy Wiitanen, Ray Kolehmainen, Charles Lucchesi, Dennis McCullough, Mike Coppo, Bruce Riutta, David Simonson, Michael Gorman, Gary Brey, Coach Earl Gorman. Seated L-R: Keith Destrampe, John Mikkola, Tom Bernard, Bud Banfield, Paul Butkovich, John Wiegrand, Edward Zellner. missing from photo Jack Colombe. Back Row L-R: Coach Earl Gorman, Edward Zellner, Bruce Riutta, Mike Gorman, Daniel Ala, Mike Coppo, Ray Kolehmainen, Keith Destrampe, Tom Barnard, Coach Andrew Wiitanen. Kneeling L-R: John Butkonen, John Mikkola, Gary Brey, Jackie Colombe, Norman Banfield, Roger Juntunen, Capt Dennis McCullough, John Townsend. Back row L-R: Bruce Riutta, Mike Coppo, Dan Ala, Roger Juntunen, Gary Brey, Michael Gorman, Ed Zellner, John Mikkola. 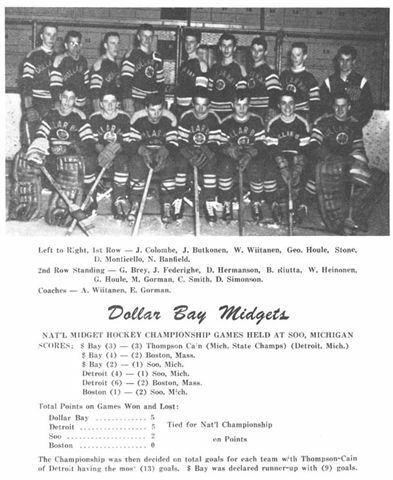 Middle row: Norm Banfield, Dennis McCullough -Captain, Tom Bernard, Keith Destrampe, John Butkonen. 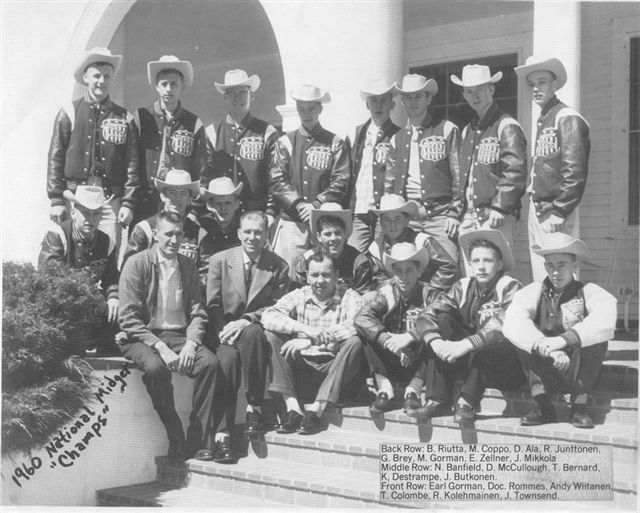 Front Row: Coach Earl Gorman, Doc Rommes (Natl Rep), Coach Andrew Wiitanen, Jack Colombe, Ray Kolehmainen, John Townsend. 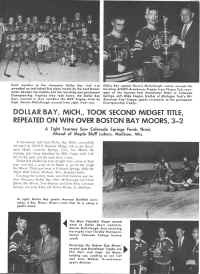 1961 The Dollar Bay Midgets tied on points for National Champions held at Soo Michigan, with Detroit, Thompson-Cain. 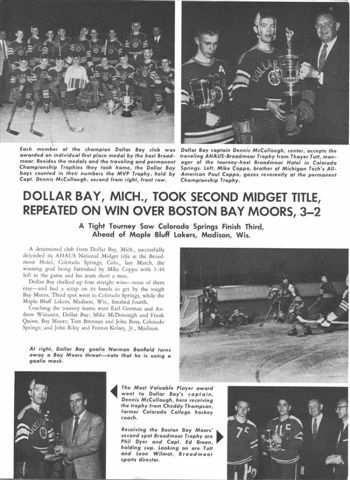 Each team having 2 wins and one tie (they tied each other) in the Tournament: the final winners were determined by a total goal count in the tournament, with Dollar Bay declared runner-up on total goals. 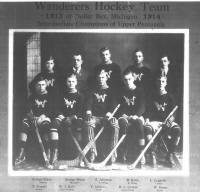 They were coached by A Wiitanen and E Gorman. Need better copy of this picture to the right. Standing L-R: Gary Brey, Jerry Federighe, Dave Hermanson, Bruce Riutta, William Heinonen, Gary Houle, Mike Gorman, Clyde Smith, Dave Simonson. 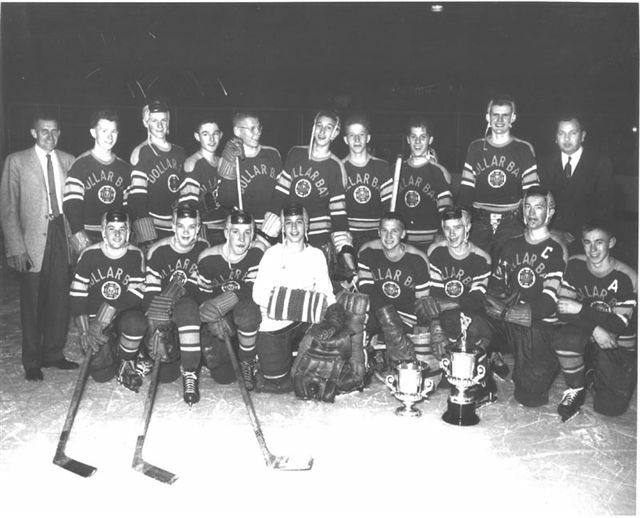 Seated L-R: Jake Colombe, John Butkonen, Wallace Wiitanen, George Houle, Al Stone, Dave Monticello, Norm Banfield. 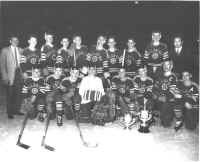 Standing L-R: Merv Klemett -Coach, Clyde Smith, Jim Wade, John Juntikka, Allen Stone, Dave Witting, Dave Hermanson, Fran Lowney -Coach. Seated L-R: Bob Treglowne, Terry Sintkowski, Bert DeHate*, Mike Lowney, Bill Downey, Herb Boxer, Mike Verbanac. Missing from photo: Bill Heinonen, Don Mylcrest*, Duane Pettcoff*. 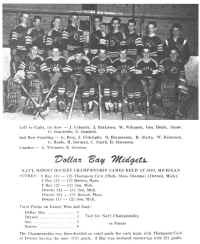 * these players were from Stambaugh/Iron River, Mi and were driven the 2 hours here for practices and games by Mr. DeHate. Midget Juvenile Southend Div Champs. 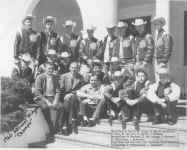 Standing L-R: Terry Sintkowski, Herb Boxer, Al Stone, Arlen Ollanketto, Howard Hendrickson, Paul Heinonen, Paul Masini, Merv Klemett -Coach. Kneeling L-R: Mike Cuff, Mike Lowney, Jim Wade, Mike Verbanac, Dave Witting, John Juntikka -Capt, Art Gullstrand. Missing from photo: Bert & Phil DeHate*, Dewaine Pettcoff*.